Toyota showed us a Spongebob Squarepants-themed Toyota Highlander last week. 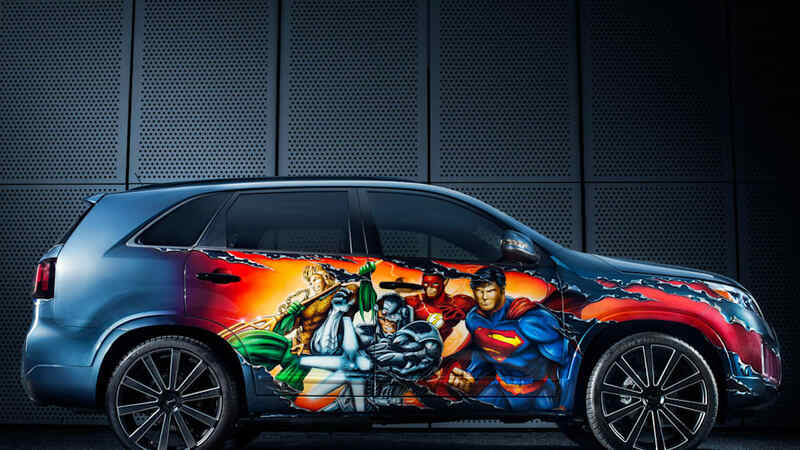 Kia has now revealed a Justice League themed Sorento. Can we just have normal, competent crossovers without all the animation frosting, please? To be fair, this Sorento is for a good cause. It will be part of a charity auction on eBay, benefitting DC Entertainment's We Can Be Heroes campaign, which raises money for the famine-ridden Horn of Africa, a region that's facing its worst food crisis in six decades. DCE's President, Diane Nelson, claims DC has managed to raise over $285,000 through crowd-funding campaigns and unique opportunities for its fans. 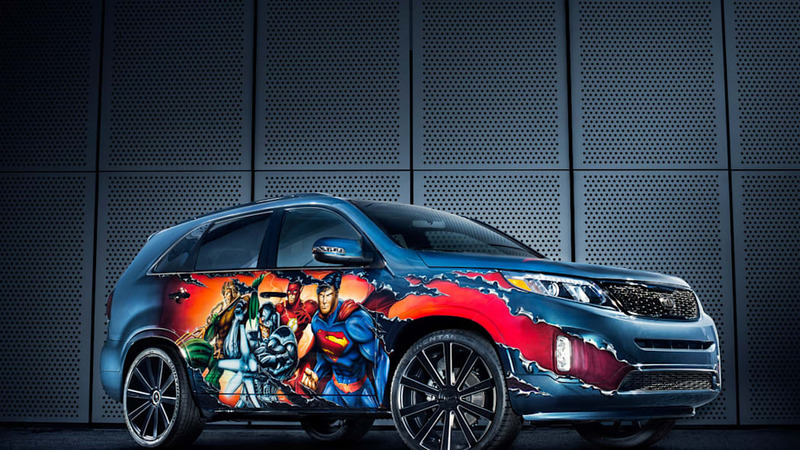 The Justice League Sorento is just the latest such fund-raising opportunity, with the automaker having already commissioned a number of similar themed vehicles for individual members of the Justice League. 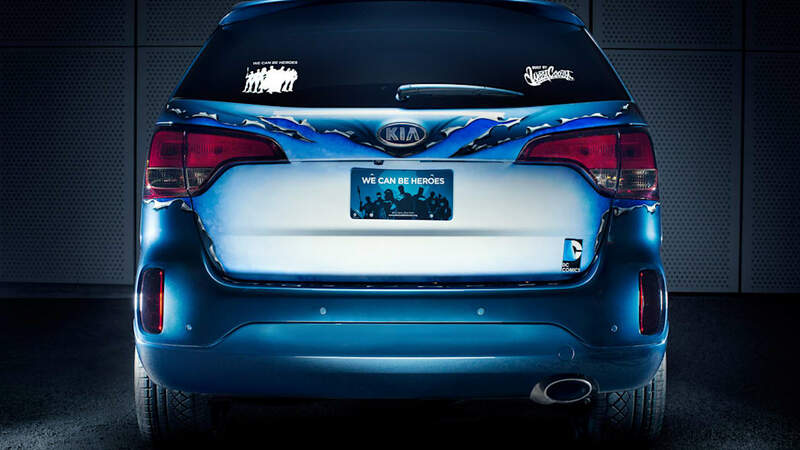 The seven-passenger Sorento was designed by Jim Lee and created by West Coast Customs. It sports graphics that, relative to the Spongebob Highlander, are downright subtle. 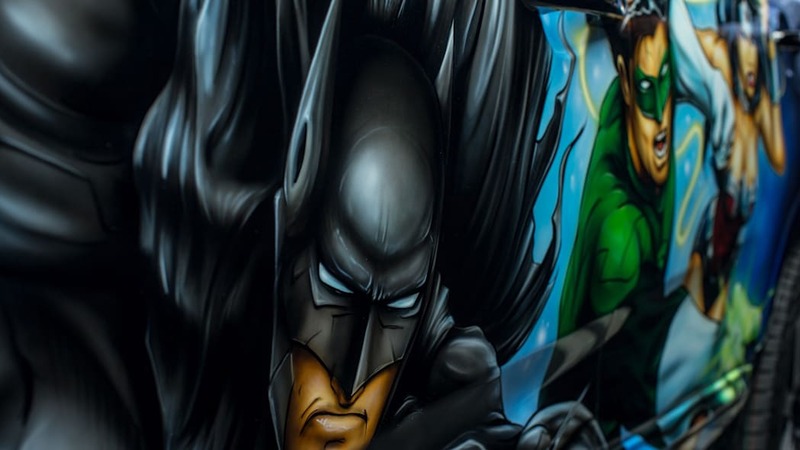 Batman, Green Lantern and Wonder Woman are depicted on the driver's side, while Superman, the Flash, Aquaman and Cyborg are on the passenger side. The Justice League logo is emblazoned on the Sorento's hood. 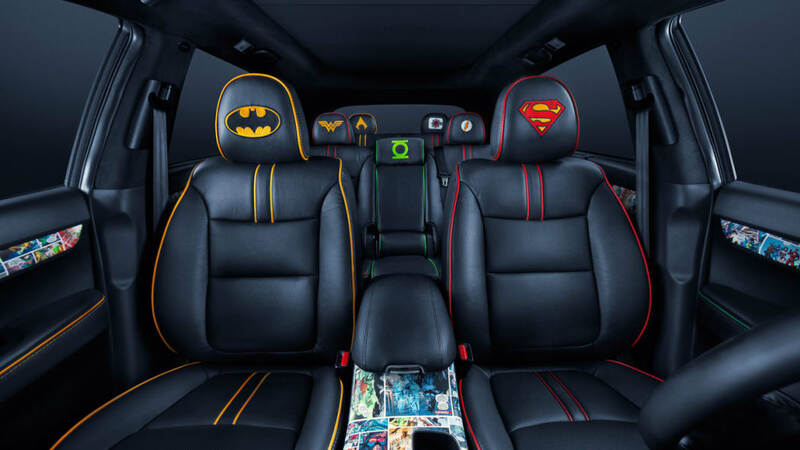 Inside, the Kia's leather seats have been customized to represent each member of the Justice League, with Superman naturally in the driver's seat. Poor Green Lantern is stuck riding in the middle of the second row. Starting today, DC will be auctioning of the Sorento, along with a bunch of other cool, unique artwork from DC artists on eBay. Bidding on the Sorento starts at $35,000. We Can Be Heroes will distribute the proceeds of the auction towards International Rescue Committee, Mercy Corp and Save the Children. SAN DIEGO, July 17, 2013 – DC Entertainment (DCE) opened San Diego Comic-Con today with a blend of artistry and giving, unveiling the JUSTICE LEAGUE-inspired Kia Sorento, the eighth and final custom vehicle built in partnership with Kia Motors America. 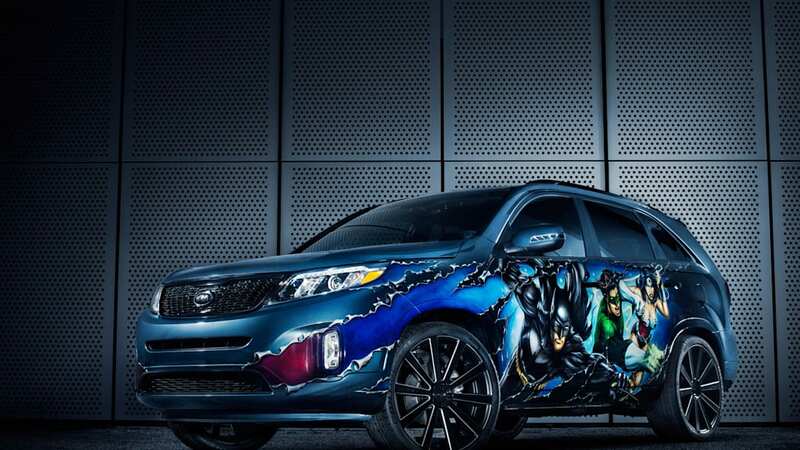 The Sorento's eye-catching design was penned by legendary comic book artist and DC Entertainment Co-Publisher Jim Lee, who completed the customization of the car before a live audience. Created to raise awareness of DC Entertainment's "We Can Be Heroes" giving campaign, the collection of all eight JUSTICE LEAGUE-inspired Kia vehicles will be on display throughout Comic-Con at the Interactive Zone at Petco Park, Official Comic-Con Partner. Following the unveiling, DCE President Diane Nelson announced that the newly revealed JUSTICE LEAGUE car would be the centerpiece of a special online charity auction on eBay which benefits the "We Can Be Heroes" campaign. Nelson announced that the 10-day charity auction was now live through July 27, 2013 at www.ebay.com/wecanbeheroes. "Our goal in 2013 was to bring our fans and the JUSTICE LEAGUE Super Heroes together in unique ways to fight the hunger crisis in the Horn of Africa. That effort started with the once-in-a-lifetime opportunities we've been able to offer through our crowdfunding campaigns that have raised over $285,000 to-date," Nelson said. "Now, through these tremendous partnerships with Kia and eBay, the auction will take the offerings to a whole new level with a truly one-of-a-kind, and fully driveable, CUV customized by Jim Lee." The seven-seat Sorento marks the final chapter in a 10-month, eight-vehicle partnership between DC Entertainment and Kia based on the iconic characters that make up the JUSTICE LEAGUE – Superman, Batman, Wonder Woman, Green Lantern, The Flash, Aquaman and Cyborg – each of which are featured on their own car designed by Lee. 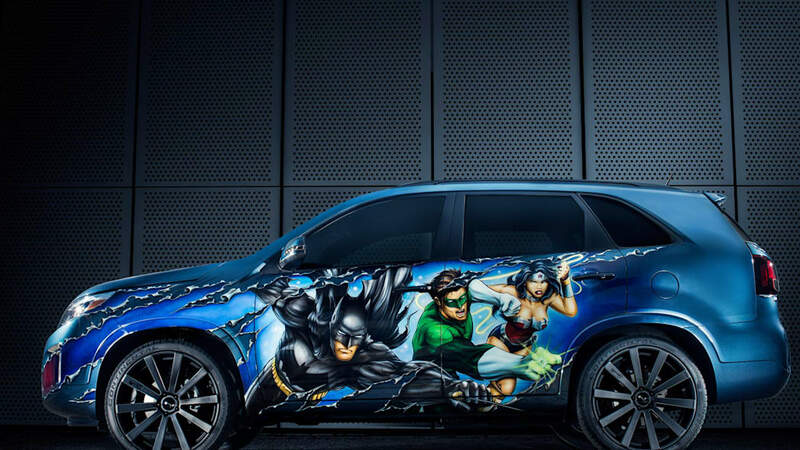 The final car captures the entire JUSTICE LEAGUE, as drawn by Jim Lee, with world-famous West Coast Customs recreating Lee's artwork through hand-painted, custom air-brushing. "This project has been challenging and rewarding for me as an artist and Kia has been a terrific partner," Lee said. "It was a lot of fun to finish the last car in front of the live audience and I think anyone that visits the exhibit this week will really enjoy seeing all eight cars together." The online charity auction also includes spectacular artwork from some of today's top contemporary artists and inspired by DC Comics' JUSTICE LEAGUE characters. The centerpiece of this collection is Justice, a large-scale piece of original artwork by Jim Lee that features the profile of Batman in a color palette inspired by the hues of Africa – yellow, green, red and black. 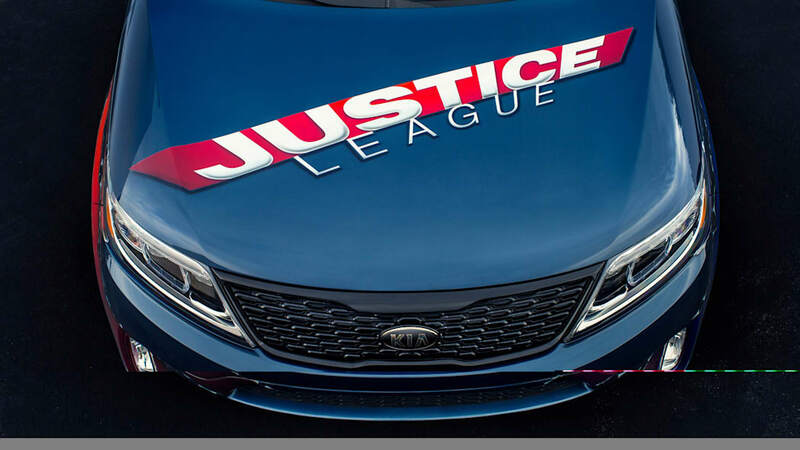 "Auctioning the Justice League-inspired Sorento is the perfect way to finish off what has been a very positive and successful partnership between Kia and DC Entertainment to benefit the 'We Can Be Heroes' campaign," said Michael Sprague, executive vice president, marketing & communications, Kia Motors America. 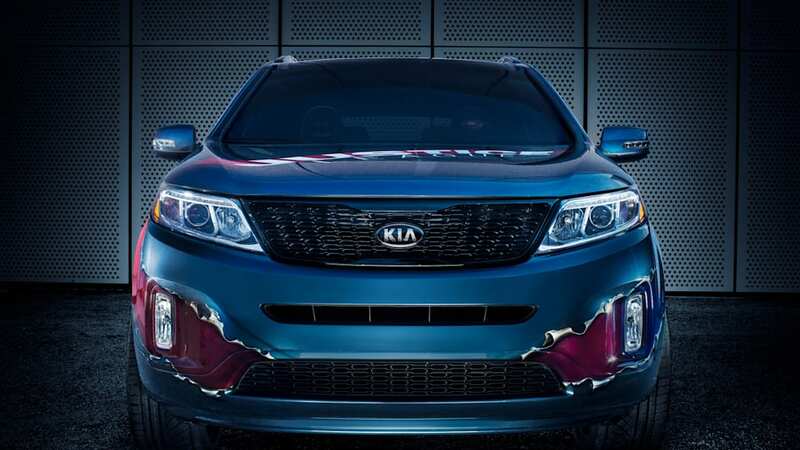 "Like all of the Justice League-inspired vehicles before it, this customized Sorento blends the automotive and pop-culture worlds while also allowing Kia to extend our philanthropic efforts to support this very worthy cause." "At eBay we strive to connect our audience with unique items they are passionate about" said Gene Cook, GM of Emerging Verticals for eBay. "We are thrilled to partner with DC Entertainment to bring this exciting Justice League event to our comic and super hero enthusiasts as well as leverage our Giving Works platform help the "We Can Be Heroes" initiative reach their fundraising goals." To date, the We Can Be Heroes giving campaign has raised over $2.3 million and helped over 5 million men, women and children in the Horn of Africa.